Video Data Analyst, Hair and cosmetic Enthusiast, Writer and GM, Tabletop and Boardgame purveyor and all-around nerd. 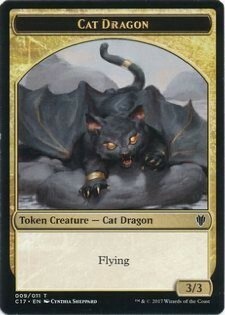 Just a little reminder about the best creature token in Magic. @inthetracks Congrats on your journey of self discovery. So I’ve been working on a video project that I think could be really cool but keep hitting hurdles. For instance I wanted to an animatic/animation but can’t draw to save my life. I want to do voiceover but when I whipped out my microphone I got super self conscious and gave myself a migraine. By the end of next week though I will have something done. Be it terrible or great right now I just need to prove to myself I can actually follow something through to the end. Hey folks, I'm thankful and humbled to say that we had some very generous donors and are now about £200 away from having all the basics covered for this month. Huge thanks to everyone who has donated or boosted our posts. I'm sorry for clogging your feed with our woes. Remember this morning when I said I&apos;d create a #DnD supplement today? For all those times you flipped through the PHB saying, "Wait, how is there not a [farmer, doctor, etc] background in here?!" Playing through a new campaign and wanting my players to feel pretty OP to start with, first session I was a little worried I didn’t make them OP enough. Tonight’s session they downed a Chimera in less than 12 seconds with it not even getting a single turn. My worries have been abated. First day of #VidconLdn done! Went to some really interesting talks on the future of social media, the taxonomy of YouTube content and snuck into the FB and Insta lounge for free juice and yoghurt covered cranberries. I call that a success! one of the reasons that white anarchists frustrate me is this belief that if you topple the state, the goodness of people will float up and all that pesky racism stuff will melt away. this is a dangerous belief. the revolution doesn't end at revolt. Heading down to London this afternoon for #vidconldn but my #lucyandyak order is supposed to be delivered today. Currently the scheduled delivery time is 10 mins before I have to leave to catch my train so gunna be cutting it fine if I want to run around the conference looking like a giant baby in his new dungarees. Was at Monkey World today (a primate rescue centre in the UK) and saw a Capuchin Monkey nibbling away on something. The little guy was eating a bird.